Not as proverbial as the Ambani saga, but the joint upward arc of the Adani-Modi graph is striking. So are the grey areas. AAP attack Arvind Kejriwal’s party wants an investigation into Narendra Modi’s “closeness” to Adani, dubbing him the corporate backer of the BJP’s ‘PM candidate’. 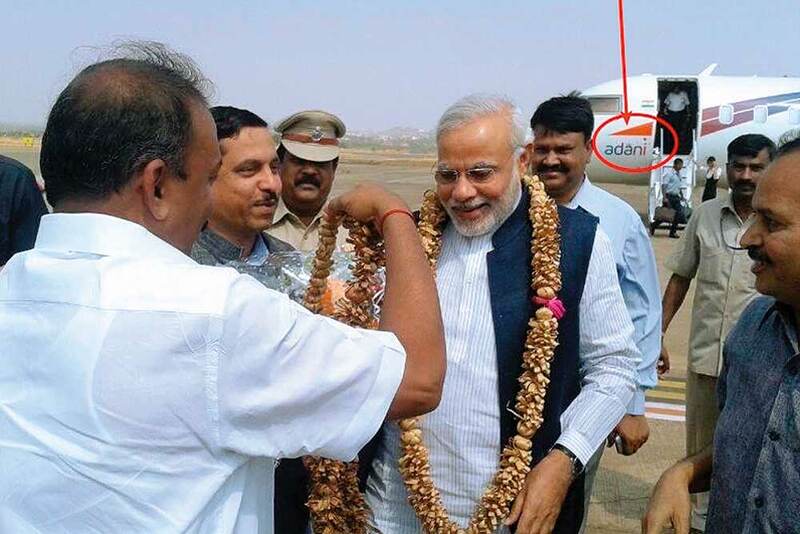 Photos of Modi using the group’s corporate jets are doing the rounds. Cheap land Adani has been accused of getting massive pieces of government land in Mundra dirt cheap (often as low as Rs 1 to Rs 16 per sq mt) when the official rates are much higher. Green norms Another persistent charge is that the Modi government looked the other way while Adani built massive infrastructure projects in the state without getting green clearances. CAG Scrutiny The CAG report on Gujarat reveals that the government was supplying expensive GSPC gas at cheap rates to the Adani group. 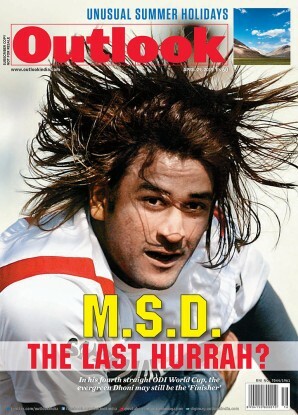 Between 2006-09, this cost the exchequer Rs 70.5 crore. Wharton withdrawal Adani withdrew its sponsorship for a Wharton Forum last year when the American university removed Modi as a keynote speaker as he did not want to get on the wrong side of Modi. ‘Jayanthi tax’ When Modi attacked former environment minister Jayanthi Natarajan, he was seen to be batting for the Adanis, whose special economic zone (SEZ) project in Mundra has run afoul of farmers and green rules. Security Clearance Adani’s port project faced problems from the UPA government when it withheld security clearances following allegations of money-laundering and customs duty violations. It got clearance in 2013. Karnataka Lokayukta In 2011, Justice Santosh Hegde faulted the Adani Group for illegal exports of wrongfully mined iron ore. He said the Adani group had paid many bribes. 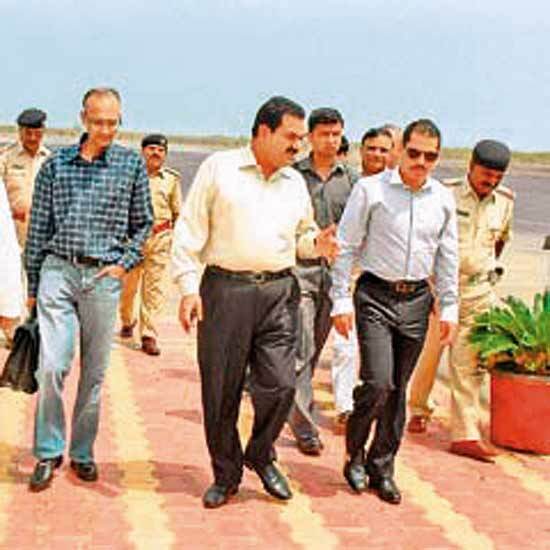 Duty evasion In 2010, Gautam Adani’s brother Rajesh Adani was arrested on charges of evasion of customs duty. The matter was closed after the payment of a fine. 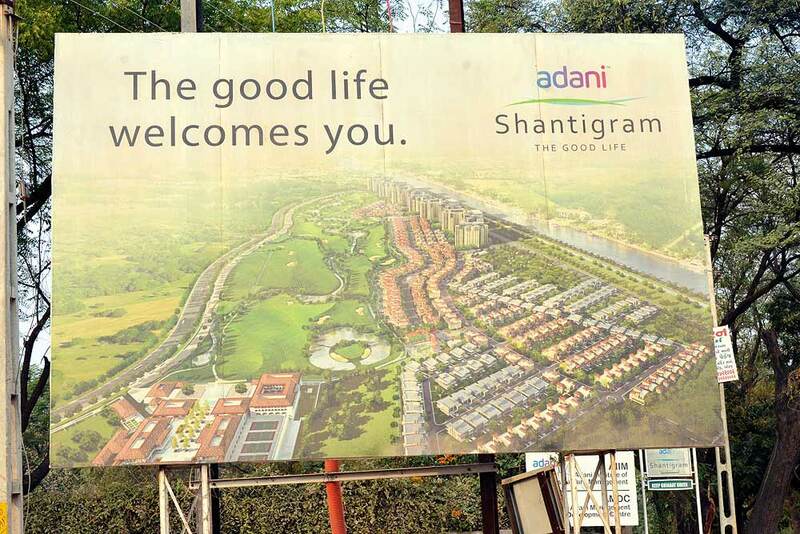 Denizens of downtown Ahmedabad say it’s better to leave early for Gautam Adani’s mansion, as it’s way beyond the BRT corridor, past the suburbs, off the Sarkhej-Gandhinagar highway. Guards do a thorough check of cars before they open the giant steel gates. It’s quite a drive from the gate to patio, with impeccably manicured lawns lined with flower beds and a fleet of parked cars. Then it’s a walk through gleaming corridors to the back lawns where a huge table is set up for breakfast. Guards lurk in the backgro­und, inconspicuous behind the trees and bushes. There is a live breakfast counter making south Indian, Gujarati, north Indian, continental and even Chinese dishes, but everything is vegetarian. Waiters move around with assorted fruit drinks, biscuits and bakes. Gautam Adani, in a formal dark suit, greets guests warmly with a broad grin and heavily Gujarati-accented Hindi, and later similarly accen­ted English. He’s India’s 21st richest man, according to Forbes, with a personal net worth of around Rs 16,000 crore. With interests in private ports, power and coal trading, this infrastructure magnate, many aver, is another Amb­ani in the making. It’s a comparison Adani discourages. But like Mukesh Ambani, Adani has been in the news lately for non-business reasons. As the pre-election season warms up, the Aam Aadmi Party has asked about the “exact relationship” between the Adani group and the BJP’s prime minister­ial candidate. 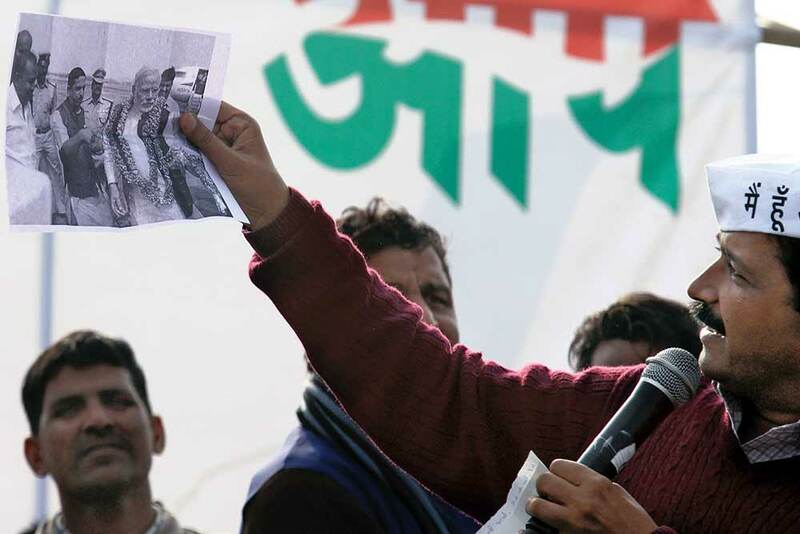 “We want to know about the rise of the Adani group in Gujarat,” the AAP’s Yogendra Yadav said at a rally. 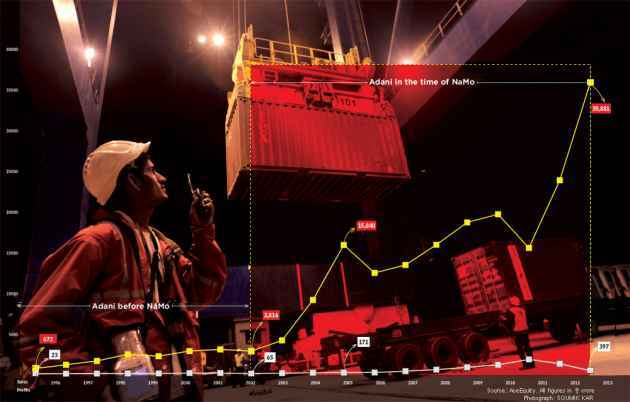 Answers are being sought on whether it’s just a coincidence that the spectacular growth of the largely Gujarat-based Adani group coincides with 12 years of the Modi governm­ent. This direct accusation by a political party explicitly verbalises more tacit spe­culation over the years on the links between Modi and the Adani group. It sharp-focuses charges that the Adani group has gained beyond measure in Gujarat, thanks to an over-eager state government that plied it with sops like cheap land, and an easy regulatory regime. The Adani group had not replied to Outlook’s questions at the time of going to press. Actually, on the face of it, such a relationship could even be seen as ‘normal’, given Modi’s corporate-friendly image, one that he has never been ashamed of­—in fact, he is ope­nly using it to reach out to voters seeking development. And there’s nobody better than Adani, after all, that symbolises the Gujarat model. He’s the first homegrown billionaire out of the western state, a fascinating journey for a college dropout who moved on from trading (import-export business, as they say) to big-ticket infrastructure projects. 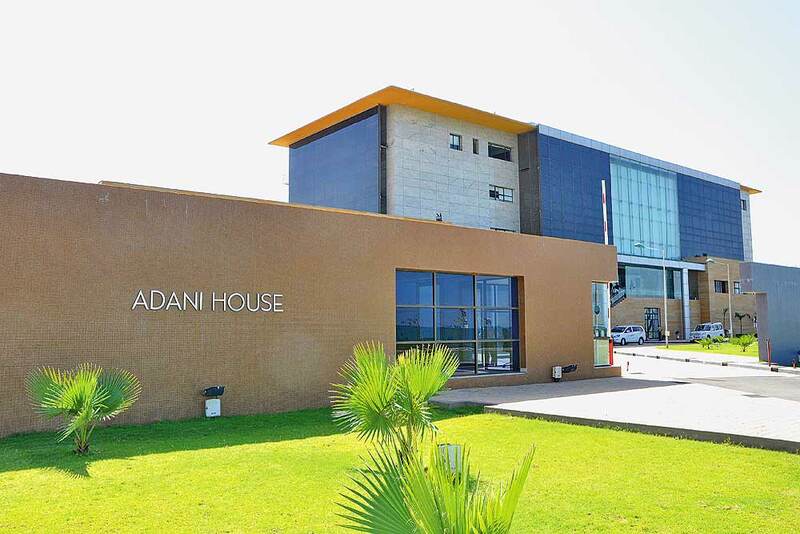 For Adani has built assets on the ground, even if most of them have been in Gujarat. He runs India’s most efficient private port, Mundra, where visitors come back with stories of how it glistens like Mumbai’s Taj Mahal Hotel (where Adani, incidentally, was holed up during the 26/11 attacks in 2008). Mundra, which also hosts an SEZ, is fed by India’s largest private rail network set up by Adani. Then there’s Adani’s power business, which may be the reason for the group’s dependence on high levels of debt (at about Rs 80,000 crore, it is among the top 10 in terms of corporate debt in India). But even here, Adani has achieved admirable capacity, like in the coal trading business or edible oils. He’s attracted good talent, and is particularly fond of surrounding himself with ex-bureaucrats. In fact, given Gujarat’s penchant for big business, some might ask why Adani alone is being targeted. The short answer is that Adani is the only big businessman in Gujarat who has made his billions after Modi came to power. His turnover has grown 12-fold in the years under Modi’s reg­ime to Rs 35,881 crore. Over the past 10 years, the Adani group’s listed firms have shown staggering compounded annual growth of 21.7 per cent in sales and, even better, 37.1 per cent in profit after tax. “For a first-generation company, its growth is frankly quite astounding,” says somebody who has closely tracked the group as an analyst. Adding fuel to the relationship between Modi and Adani is the fact that the two have openly reached out to the other in the past. For instance, it was Adani’s decision to cancel the sponsorship of a Wharton India Economic Forum event last year after it dropped a live video address by Modi. Or in arranging a special air-conditioned tent on the university grounds when Modi staged a dharna in Ahmedabad over the Narmada water issue. At last year’s Vibrant Gujarat function, Gautam Adani was the only businessman (apart from Anil Ambani) who made a clear pitch for Modi, saying that he hoped “Modi would migrate northwards (read Delhi)”. In an earlier Vibrant Gujarat, surrounded by the Tatas and Ambanis, it was Adani who got to sit next to Modi. More recently, when Modi attacked former environment minister Jayanthi Natarajan, most agreed he was batting for the environment concerns Adani’s Mundra port was facing. This close relationship goes back to the early days of Modi’s regime. For almost a year, he sidelined Reliance, which had had very close relations with his predecessor, Keshubhai Patel, and forged links with the Essar group. But then, the Gujarat riots happened and senior CII members attacked Modi. As journalist Kingshuk Nag reminds us in his recent book, The Namo Story, “Leading businessmen of Gujarat who were on the same page as Modi regrouped under the Resurgent Group of Gujarat (RCG). Along with Karsenbhai Patel of Nirma, it was Adani who played a key role in the formation. A statement issued by them said, ‘Forces causing embarrassment to the state globally need not misunderstand peace-loving and tolerant nature of Gujarat as its weakness’.” Later, Adani cemented his hold on Modi’s regime by making big investment plans in Vibrant Gujarat functions—he also leads the lobbying for Modi abroad. In return for this support, what did Adani get? Land, cheap land, and lots of it. Ahmedabad-based lawyer Anand Yagnik has been fighting cases in the Gujarat High Court and the Supreme Court against allocation of land given to the Adani group by the Modi government. Indeed, he has horror stories to recount—all land allocation to the Adani group after Modi came to power has been done at a price much lower than the Jantri price (arrived at after evaluation of land by the Gujarat revenue department). In case more than 10 acres of land is allocated to any party at a price lower than the Jantri, the power of clearing that allocation moves from the local collector to the state revenue secretary. The revenue ministry was headed by Anandiben Patel, a close aide of Modi. According to Yagnik, all clearances to Adani were made at a swift pace—the group got land at prices ranging between Rs 1 to Rs 16 per square metre. This when land for industrial purposes in the area is worth Rs 200-300 per sq metre. In fact, Yagnik says that in the pre-Modi regime, the Adani group’s land holding was about 3,000 acres. In the Modi era, this has increased to about 2 lakh acres, of which 45,000 acres has been given by the state. Indeed, the group has stated before the commerce ministry and submissions before the courts that it has 45,000 acres of land only for the SEZ. The Mundra port stretches over 35-40 km of coastline (almost equivalent to the size of Mumbai)­—this was given to the group for about Rs 33 crore (when the Jantri value of the land was Rs 3,000 crore). Yagnik adds that the Adani group also did large-scale dredging in the coastal areas to support its port. This new land was evaluated by the government and given to the company at thr­owaway prices. “The land was then sold by the Adanis to IOC, ONGC and other PSUs at rates of over Rs 600 per sq metre. The Adani group was also exempted from all stamp duties for the thousands of acres of land at the SEZ, making the magnitude of this state subsidy phenomenal,” concludes Yagnik. The other big issue is the environment. At the showcase Mundra port, Adani has also run afoul of environmentalists for violating the Coastal Regulation Zone rules, illegally cle­aring mangroves and contaminating the water with inadequately treated waste water, leading to considerable damage to the coastal areas, alleges Dr Kanubhai Kalsariya, a former BJP MLA supporting the agitating fishermen living in the Navinal village within the Mundra SEZ. The fishing communities in the area fear the destruction of their traditional fishing grounds, even denial of access to it. At the heart of all this is a disregard for the law. “Adani proceeded on construction of facilities at Mundra without the required environmental clearances—on the basis of an in-principle clearance given to part of the land in 2004. Adani’s land was approved in 2007,” says Suresh Mehta, ex-Gujarat CM who’s also had a stint as state industries minister. Former home secretary G.K. Pillai, now an independent director on the Adani ports and SEZ board, clarifies that all the units have individually got green clearances while the SEZ has got the nod from Gujarat Pollution Control Board. The wait now is for the Union environment ministry to give its decision based on the recommendations of the Sunita Narain Committee report. Incidentally, Pillai faced some questions for taking up the job with the Adani group while it was still awaiting security clearances in 2010-11. Pillai’s defence is he took up the assignment nearly 20 months after retirement. The government held up security clearances following allegations of money-laundering and customs duty violations (the issue has been resolved with payment of fines). 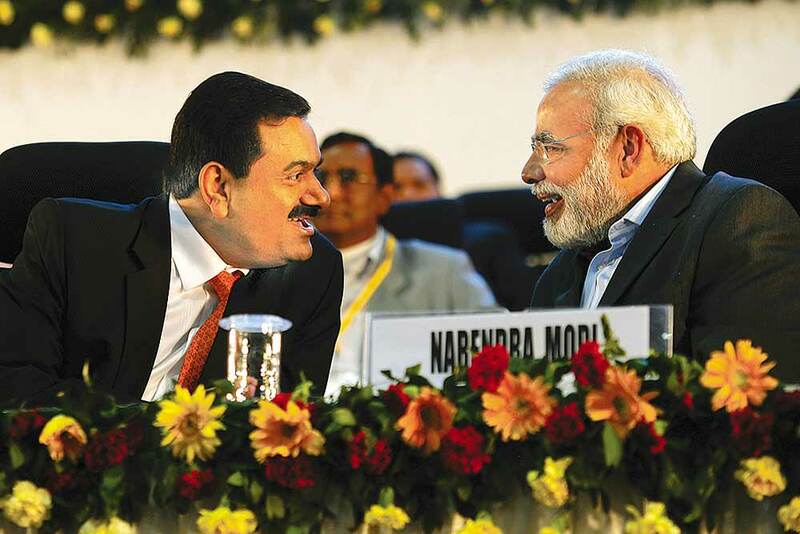 Official sources claim that many of Adani’s problems at the Centre stem from his perceived closeness to Modi. That may be partly true. But that doesn’t fully explain the many other controversies surrounding the Adani group. Born in 1962 in Ratanpol, north Gujarat, into a family of 7 siblings. Father was a commodities trader. In 1978, Gautam dropped out of morning college classes in Mumbai and became a diamond trader; moved to Ahmedabad in 1981 to help start a cousin’s PVC-trading firm. Adani sets up his commodities trading venture in 1988 with Adani Exports. Today has a personal net worth of $2.65 billion (approximately Rs 16,000 crore). Is most comfortable speaking Gujarati; is reputed to be decisive, humble, and a good listener. Likes to surround himself with ex-bureaucrats, whom he looks after well; said to know the first names of his top 500 executives. Claims to have good relations across the political spectrum, but is closest to Modi and makes no bones that doing business in India requires access to politicians. 20 is his lucky number. Has set targets with that number for the year 2020 (200 MMT of cargo handled, 20,000 MW of power generation capacity and so on). Was kidnapped in 1997 in Ahmedabad, released after 18 hours when ransom was paid; police say Adani had to be “gently persuaded” to file a complaint. Adani was also inside Mumbai’s Taj Hotel when it was attacked on the night of November 26, 2008; says he was amongst the last to get out safely. Has a fleet of BMWs, and a penchant for vintage cars. Also has three aircraft including a Beechcraft and a Bombardier, plus helicopters. Has a dentist wife who now works with Adani, two children. Nephew Pranav Adani closely works with the group. Trading Adani is India’s largest private trader in coal, with mines in Australia and Indonesia. Ports & SEZ With Mundra, it’s also India’s biggest private port operator. Also has two more ports (Dahej and Hazira), four ships, and India’s largest private railway line. Power Coal-based power producer with 9,240 MW installed capacity. Edible Oils 50:50 JV with Wilmar Group of Singapore, has 18 facilities across India. At 2.2 MT/year, it has one of the largest refining capacities in India. ‘Fortune’ is the main brand. Agriculture Has investments on the ground in fruit cold storage and foodgrains storage. The Adani Group chairman's responses to questions for this week's cover story reached us after we had gone to press.